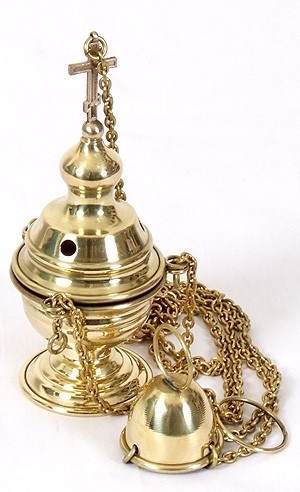 Traditional Orthodox censer for private services. Brass. Size: 2.4''x6.7''x23.6'' - including chain (6x17x60 cm). Thank you for your help. As always I am happy with your products, you are the best in the business. 14 various 100% beeswax church candles. 35% off Seven-branch altar stand - 4. This offer expires on Nov. 12/25 at 24:00 CST or until supplies last. Product specials can be viewed on the Special offers page. Special offer discounts apply only to the general product prices (shown in red) and can not be combined together or with Wholesale prices. Tip: If you're in the US and your card is being declined when you place an order, most likely your bank has a security block for trans-border transactions. Just call your bank, using the toll-free no. on the back of your card and let them know it is you who is placing this order. They'll lift the block and after that you can conveniently place your order. Copyright © 1999-2016 Istok Church Supplies Corp.